Sweden's southernmost national park on the east coast of Skåne offers delightful hiking trails viewpoints over the sea, a white sandy beach and beautiful apple orchards. Enjoy beautiful sunset strolls and climb the 97 metre-high viewpoint over the sea at Sweden’s southernmost national park. Drop into the Visitor Centre and learn all about the park’s nature and wildlife. After a tough hike, pop down to the silvery sandy beach in the park and watch magical sunrises over the sea. Set your alarm, fill your thermos and breakfast basket, and watch the day break in Österlen. The abundant flora of Stenshuvud includes many rare species. Stenshuvud national park covers around 400 hectares, including 80 hectares of sea. The mountain has three peaks and the northern one is the highest and most popular for hiking with its magnificent views over the sea. Stenshuvud is home to a diversity of sandy heaths, wet meadows, rocky coastland and beautiful sandy beaches. There is a bog and alder marsh on the west side of the hill. The abundant flora includes rare species such as barren strawberry, black spleenwort, sand pink, pasqueflower and immortelle. Read more about the plant life at Stenshuvud here. Don't forget to bring your thermos on your hike. Stenshuvud National Park offers great hikes and great views – and dogs are welcome. The path up to the viewpoints are flanked by lush hornbeam forest and large oak trees. Billed as Skåne’s most exotic beach, it’s a magnet in summer. The fine sand and shallow sea make it a paradise for families. But be careful of the currents when you swim further out. Free your feet from your hiking boots and take a refreshing walk on the beach. Don’t miss the lookout points north of the main entrance. The distance between the highpoints is just a kilometre and you can choose between three different points. Or take in all three to see the coast in different directions. The path up is flanked by lush hornbeam forest and large oak trees. The sand heath is an unusual biotope. The ground comprises only sand. Pasqueflower, grey hair grass and St Bernard's lily thrive here. During the summer the rare tawny pipit breeds in the heath. White and bright, the lighthouse stands on the rocky shore on the seaward side of Stenshuvud hill. Follow the yellow trail along the sea through a gnarled oak forest. In some places the path is rocky, so a tip is to wear good shoes or boots. There are different hiking trails in Stenshuvud National Park, all colour coded to make them easy to follow. The blue trail is a pleasant stroll down to the sea. Start and finish at the Naturum Visitor Center and follow the blue marks. This trip is customized for people with physical difficulties. Skirt the fringes of the orchid meadow with its summer floral splendour. Walk on to the beach and check out the Krivareboden eel fishing hut that used to be a starting point for fishing before Skåne became part of Sweden. This is the classic Stenshuvud trail to the top of Stenshuvud through a beautiful hornbeam forest . Before the top you pass an ancient castle wall before the view of the sea and Hanöbukten bay. Hike down the steps and follow the yellow trail back for a longer walk, either along the alder marsh on the inner side of the hill or follow the edge of the sea southwards. This part of the yellow trail is rocky so be careful. This trail takes you from the main entrance northwards through the hornbeam forest, past the alder marsh, the north entrance and arboretum, then back through the oak forest on the east side of Stenshuvud. You pass the sandy beach before the trail turns towards the main entrance and Naturum. This trail is rocky in places. The orange trail starts from the north entrance and takes you through the arboretum that was planted by Carl Ekenstam at the end of the 19th century. The trail is adapted for the disabled. If you’ve been to Stenshuvud a few times and want some variety, this is one of the most beautiful places you can find. The vantage point on Kortelshuvud gives you a view over Stenshuvud and the sea. Walk the loop through a birch forest, hornbeam forests, meadows filled, pastures and the wonderfully long valley along the north branch of the Rörum river. The Skåneleden trail takes you through the national park from Kivik in the north to Simrishamn in the south. Follow the orange markers with the letters SL4 (Skåneleden trail section 4). From the north this trail goes through Stenshuvud, down to Naturum and then along the beach towards Simrishamn. Choose which way to go and what to explore – the choice is all on you! The park has two entrances; The main entrance and northern entrance. The Naturum information centre is by the main entrance. It has an interesting exhibition about the national park. The largest car park is here and it’s where you’ll find information boards with displays, brochures and maps. There’s a toilet. From here you can easily walk the 500 metres down to the sandy beach. Next to the car park there is a large meadow with several picnic tables and two shelters where you can enjoy coffee and a snack. The majority of the park’s different hiking trails depart from here. There’s a car park, toilet and an information board with brochures and maps of the national park. From here you can reach the Skåneleden trail (SL-4), that leads to the arboretum (400 metres) and to Naturum visitor centre about a 2-km walk to the south. You can also reach the yellow trail that takes you around the hill (about 4 km). At Naturum Visitors Center you'll get all information you need to find the best spots in Stenshuvud National Park. The Naturum Visitors Center is at the main entrance. There’s a national park exhibition and knowledgeable personnel are on hand to help you with your questions and provide tips on where to go and how to find your way around the park. Naturum is open daily during the summer and Tuesday-Sunday in spring and autumn. It is closed from December until February. Naturum offers guided tours every day during the summer and on Sundays during spring and autumn. The tour takes about 1.5 hours and you will learn all there is to know about the area’s history, how the land has been used in the past and about cultural relics. The guide gives you details about flora and fauna you see along the way. It also gives you an insight into how the area is administered and what is being done to preserve its nature. 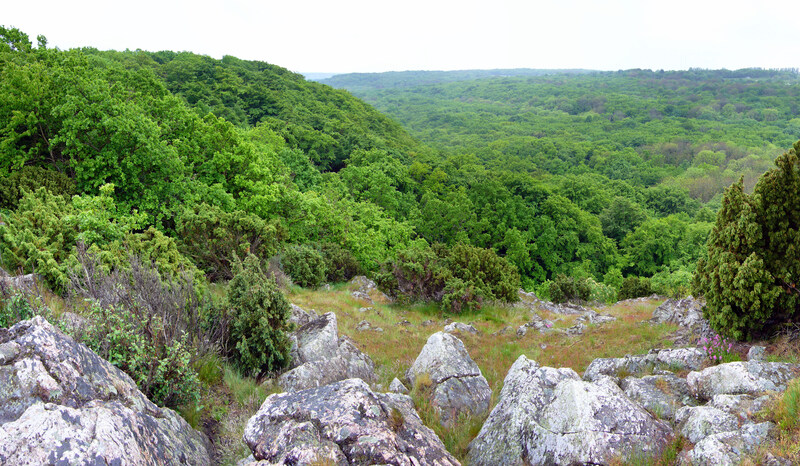 Stenshuvud National Park is just south of Kivik, about 15 km north of Simrishamn. You’ll see signs from road 9 pointing towards the main entrance. There are signs to the northern entrance from Kivik. It’s easy to get here by bus. Take Skåneexpressen number 3. The walk to the park from “Mellby skola” bus stop is about three kilometres. Just walk left by the red fence towards the village of Svinaberga. Follow the signs from there to the national park.